Located in picturesque southwestern Wisconsin, Big Valley Ranch is set among the beautiful rolling hills and deeply carved valleys of the driftless region. This unique area escaped the last of the retreating continental glaciers over 10,000 years ago; thus obtaining its unparalleled allure. Come take in the fresh country air and abundant wildlife. Explore the 45+ miles of trails and 800 acres of forest, fields of prairie grass, and lush grassland pastures. At Big Valley we aim to please and will make sure each visit is a memorable one. It truly is a one-of-a-kind family owned and operated destination. The amenities available are only the best. We have 40 single outdoor stalls, 20 buddy paddocks, and 8 premier indoor stalls to offer. Want to warm up your horse before hitting the trails? There is a round pen as well as a 150 x 300 outdoor arena waiting for you. Electrical hookups are easy to come by, both 20 and 30 amp. Big Valley Ranch holds three houses for nightly and weekly rentals, along with both electric and traditional campsites to accommodate all of our guests. Whether your here on horseback or gathering with friends or family Big Valley Ranch has something for everyone at every budget. Take a look at our renovated luxurious Barn House. 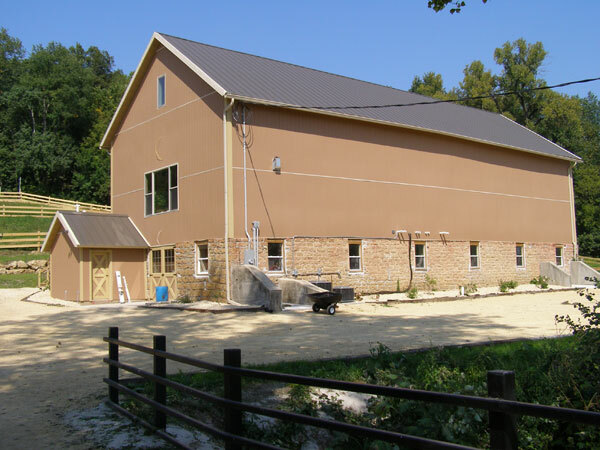 Sleeping up to 14 people, the Barn House has 3 full bathrooms, a fully equipped kitchen, dining room, and living room. Attached to the living quarters we have created our very own saloon and game cove. Although not a facility serving spirits, it houses saddle stools and a bar to enjoy your own beverages! For outside activities we have included a lit, covered picnic pavilion with ceiling fans for those hot summer days, as well as a buffet counter for your outdoor meals. Engage in a game of sand volleyball, horseshoes, outdoor ping-pong, tetherball, or just sit back and relax next to the campfire. Big Valley Ranch is meant to be versatile. Let us know what kind of experience you are looking for and we will do our best to accommodate. Our piece of paradise is meant for anyone who wants to escape from the stressful go-go-go lifestyle we often find ourselves in. Come sit back, unwind, and let yourself experience our cozy western retreat.